Rating : - 12V & 24V. Sheath Material: SS 304 / SS 310 / SS 316 or as per customers’ specifications. 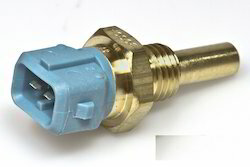 We are manufacturing Brass Temperature Sensor, Allows temperature measurement in several liquid media (coolant, fuel, oil). Single element, Multiple element, High performance Sealing and Fiber optic Sealing. - Absolute ease of operations. - Pressure sensors with built in display. - Online temperature measurement with display. Temperature Sensors, temperature sender for ambassador, jeep, maruti, indica, cars, trucks, tractors and all other automobiles including temperature indicator, temperature gauge, temperature meter. Environmental Sensor Technologies Pvt. Ltd.